At Old Glory Gun Safes, we didn't become the world's fastest-growing gun safe manufacturer by sitting on our hands. 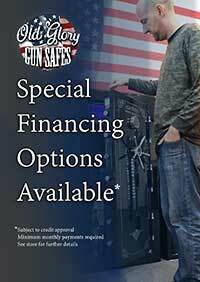 Our Premium Gun Safes thrive on technology, value & innovation. That's why this 2018 Gun Safe Catalog is packed with the amazing gun safe designs and features you won't find anywhere else.